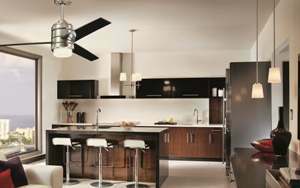 It may be getting hot outside, but your home will feel cool and look cool with a sleek, modern, stylish ceiling fan. When it comes to ceiling fans, you may not usually think of beautiful design and high-end artistic styling. Yet, many of the newest ceiling fans from ALA-member manufacturers are not your everyday fans. They feature sleek lines, modern finishes, natural materials and rich colors. Today’s fans are so beautiful, you may forget you are saving money and energy while enjoying the experience of having a work of art in your home. See the newest ceiling fans and lighting products at your nearby Hortons Home Lighting showroom. No, it is more important for a ceiling fan to be the right size for your space. Rooms that are 150 square feet or larger require a 52-inch diameter fan to be most effective. Smaller rooms can use either a 42-inch or 48-inch diameter model. Larger great rooms may require bigger fans with up to a 72-inch span. While most ceiling fans have five blades, that is more of an aesthetic consideration rather than a practical one. A fan with fewer blades actually moves more air. Fans located high in a space, such as in a warehouse or home with extremely high ceilings, will typically be three-blade, industrial-grade fans. Visit Hortons to speak with a lighting professional. The 2014 issue of Lighting magazine is a great place to read about the latest lighting trends and see the newest ceiling fans available for your home. The magazine features pictures of the most beautiful, innovative light fixtures and ceiling fans on the market. If you see a specific product that you would like more information about, just stop by your local ALA-member store with the magazine, and let them go to work for you. For more home lighting ideas, you may request a complimentary copy of Lighting from ALA, or simply view the magazine online. Pick up your free copy of Lighting magazine at a Hortons store. Request your free copy of Lighting magazine.